Walk through 3000 years of history, between curlews, sheep and squelching mud to perch on a newer 'castle' on the Pennine Way overlooking Epiacum Roman Fort. There’s family trails from the car park, or you could catch the steam train and walk up from Kirkhaugh Station. This is a working farm, home to sheep, cattle and lots of wildlife, with ancient ruins, bastle houses, and silver mines. www.epiacumheritage.org for more info on the amazing history of the area. Epiacum Roman Fort and the farmland it sits in have been shaped and cared for in many different ways over the last 3000 years. The landscape here retains its raw nature, providing elemental experiences that people in the past would also have shared: starry skies, buffeting winds, frosty hollows, birdsong, and sun chased shadows crossing the fells. The geocache is an A5ish lock & lock box in a camo bag. It’s easily accessible from the Pennine Way and Isaac's Tea Trail long distance walks, as well as shorter trails from Epiacum car park and the South Tynedale Railway. There are lots of cafes, shops and pubs, a playground and petrol stations just up the road in Alston. The views are spectacular and the history of this place is incredible, but do come prepared to get mucky and wet! The ground is peaty grassland and is frequently extremely muddy, uneven, steep and slippery, and you can be very exposed to the weather. There is a long (approx. 500m), steep hill to climb up from the car park to the fort. There will be free roaming farm animals, so please keep dogs on a lead and leave gates as you find them. There is no shelter, toilets or refreshments available on the site. You should definately consider wearing sturdy waterproof footwear and water and windproof clothing and bring a snack and drink. Make sure you dress for the weather and be prepared for it to change swiftly! Through earlier ‘molehill surveys’, where volunteers sifted through the earth dug up by moles – who are the only beings allowed to excavate the scheduled site - many artefacts have been discovered. Although many are pot sherds and pieces of slag, treasures include a bronze dolphin thought to be a razor handle found near the bathhouse, a blue and red glass bead, a fragment of a Samian hunting cup and the carved stone alter to Apollo which is on display in the Great North Museum- Hancock in Newcastle. Roman history: Epiacum Roman Fort is a Scheduled Ancient Monument and nobody is allowed to dig the ground here without special permission. 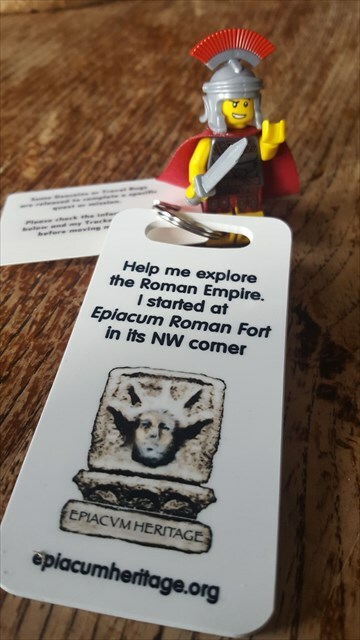 Its remote location and very small archaeological excavations, mean it can be regarded as “The best preserved Roman Fort across the Roman Empire” (Prof. Stewart Ainsworth, English Heritage, 2009). The fort is a rare diamond-shape and is on a prominent knoll overlooking the South Tyne river valley. It is notable for an impressive array of outer defences - four lines of bank and ditch to the north and east, and an impressive seven to the west - and for its exceptional state of preservation. There is evidence of a vicus (civilian settlement outside the fort), a parade ground (only the second known in the UK) and of a temple. 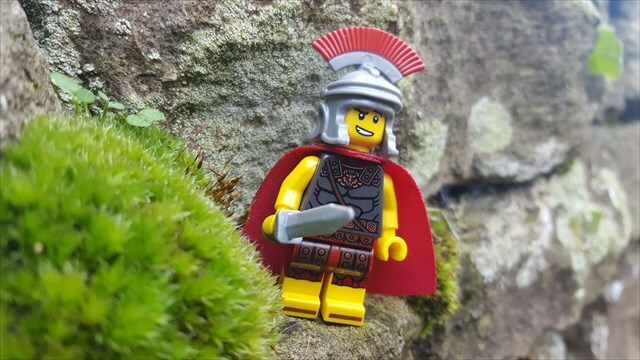 The Romans almost certainly chose this spot so they could control the movement of lead and silver they had mined from nearby ore-fields as it was probably sent north to Hadrian’s Wall and south to Roman cities like York and Chester. Other history: The fort is on Castle Nook and Whitlow Farm, which is on the boundary between Northumberland and Cumbria. Centuries of low-impact land management have preserved many features which indicate c.3000 years of continuous habitation. A LIDAR (aerial laser imaging) survey reveals remains of buildings of a native British or pre Roman community (one has been excavated by volunteers), 20+ shielings (seasonal shepherding houses), earthworks, track ways, mines, a bothy, ridge and furrow plough lines, limekilns, bridge abutments, field boundaries, and six or so farmsteads, two of which are currently occupied (Whitlow and Castle Nook). There are upstanding remains of four bastle houses (one is grade II listed) from the late medieval Border Reiver wars between England and Scotland. Complex field walls over the earthworks of the fort probably date to a 17th century division of the land. Landscape heritage: The site is entirely within the North Pennines Area of Outstanding Natural Beauty and has an unrivalled view overlooking five valleys - up and down the South Tyne, up the Ayle Burn, the River Nent and the Gilderdale Burn. Epiacum lies at the intersection of transport routes which cross the North Pennine mineral ore field. The farm was the site of a 13th Century meeting of Norman Barons to “fix the marches between the kings of England and Scotland”. The Maiden Way (and possibly other Roman Roads) passes through the farm, so Epiacum was a well-connected part of the Roman Empire. The South Tynedale Railway, the 18th century turnpike road between Alston and Brampton, and the old main road, now followed by The Pennine Way and Isaac’s Tea Trail long distance footpaths, continue this today. Natural history: The farmland has been managed in ways that have preserved the archaeology and conserved the biodiversity. It is assessed by as ‘severely disadvantaged’ and managed under a Higher Level Stewardship Agreement with a Farm Environment Plan as part of the European Union to keep it in good condition. Currently extensive grazing by small numbers of sheep, and periodically cattle, protects the delicate archaeology below ground. Ancient ridge and furrow, documents, maps and archaeological surveys indicate different land management in different eras. Protected species include: black grouse, curlew, grey partridge, and lapwing. Documentary History: Epiacum is first mentioned in ancient times by Ptolemy in his Geographia. The land ownership is documented in the late 12th century, and after a hiatus during the Reiving centuries, is picked up again in the farm’s own records spanning from 1657 to 1868. These relate to the multitude of buildings, steadings and farm tenements on the site, including the birthplace in 1713 of Rev John Wallis author of ‘The Natural History and Antiquities of Northumberland’. These documents have been transcribed and catalogued by a volunteer and originals can be seen in the Northumberland Record Office at Woodhorn museum. 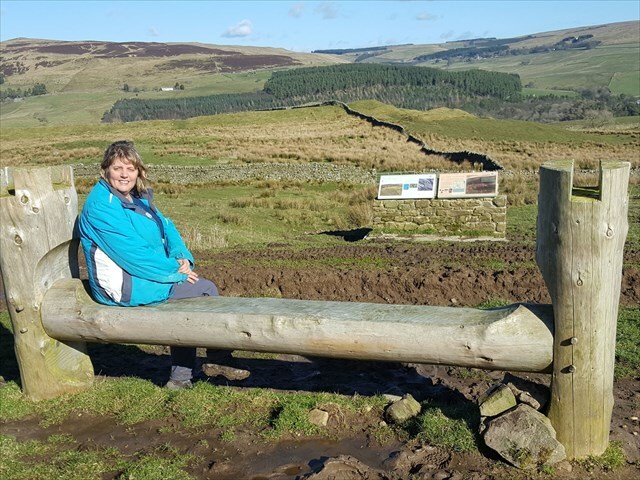 Landowner Elaine Edgar overlooking the fortYou can see for miles from or bench on the Pennine Way. The fort is just in front of you - you can see why the Romans chose this spot!